KUALA LUMPUR: Tradewinds (M) Bhd is buying a commercial property from its sister company for RM510 million, which will be used to develop the proposed Menara Tun Razak 2 (MTR2) project. More than 80 per cent of the funding will come from bank borrowings, while only RM76.5 million will come from internally generated funds. Tradewinds' wholly-owned unit, Sovereign Place Sdn Bhd, signed a sale and purchase agreement with Skyline Atlantic Sdn Bhd, a 100 per cent unit of Tradewinds Corp Bhd (TCB). 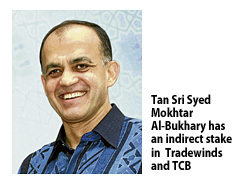 Tycoon Tan Sri Syed Mokhtar Al-Bukhary has an indirect stake of 42.97 per cent and 71.48 per cent stake in Tradewinds and TCB, respectively. The proposed Menara Tun Razak 2 project, or MTR2, comprises a new eight-storey car park podium, a single-storey food court and a 31-storey "Grade A" office tower block above the car park podium. The construction of the proposed MTR2 building is part of the redevelopment plan of the existing 36-storey MTR1 building together with a four-storey annex building. The redevelopment will also entail the refurbishment of the MTR1 building facade and the demolition of the annex building where the proposed MTR2 building will be built. The Tradewinds group is one of the largest food and commodity groups listed on the local stock exchange with subsidiaries ranging from Tradewinds Plantation Bhd, Padiberas Nasional Bhd and Mardec Bhd. The group currently houses a staff of 400 at its headquarters at Menara HLA, which it has been tenanting for the past two years. "The proposed acquisition will allow the group to own its own 'Grade A' MSC-compliant corporate tower with green building accreditation with gold plus level by BCA Green Mark (Singapore) which is strategically located within the vicinity of the commercial hub of KL city centre," Tradewinds said in its filing to Bursa Malaysia. The proposed acquisition will also allow the company to consolidate and centralise its businses units as well as business functions to achieve greater operating efficiencies. Out of the 31 floors of office space of the proposed MTR2 building, the group intends to occupy 10 floors and rent out the remaining floors. This will allow it to save on rental and at the same time, generate additional income stream arising from the rental of unused office spaces. The MTR2 is expected to be completed by early 2016.